Have you ever wondered how many calories you consume on Halloween night? 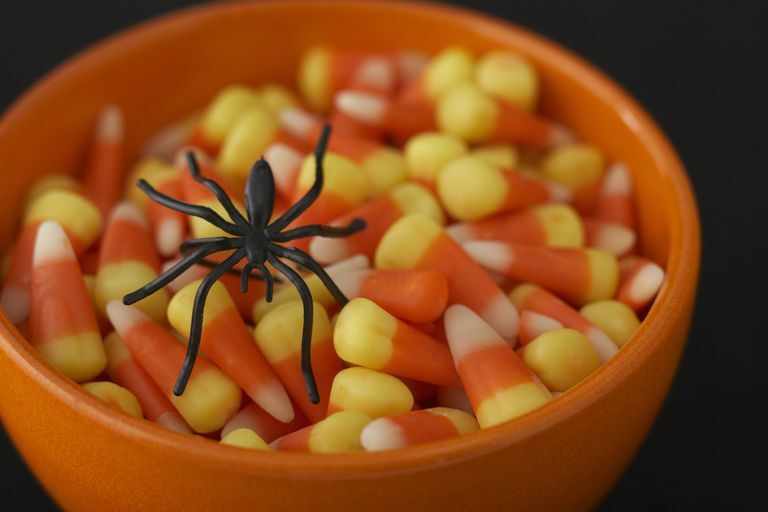 Some news sources have estimated that children consume between 3500 and 7000 calories from Halloween candy each year. But what about the adults who hand out the candy? How many calories do we consume when we hand out Halloween candy to trick or treaters? You probably don't add up the calories from every fun sized candy you consume during spooky festivities. But if you're trying to slim down—or simply improving your eating habits, you might want to do just that. It might help you to make more careful choices when you indulge. Halloween candy calorie counts vary depending on which treat you choose. To get an estimate of your total calorie consumption on Halloween night, consider the calorie counts of the most popular Halloween candies. Most fun size treats provide 60-100 calories. The actual calorie counts for the most popular Halloween candies don't seem very high. In fact, some dieters might not worry about the calories in the fun-sized treats. But we usually don't eat just one. To get the real calorie count of your Halloween night you need to think about how much candy you eat between visits from ghosts and goblins. Do you eat two treats each hour? Or do you grab three or four candies? This pattern of mindless eating could add up to between 640 – 1,280 calories if you hand out candy for 4 hours. And that doesn’t even include the candy you grab from your kids’ stash when they come home at the end of the night. The calorie count of each piece of Halloween candy is not very high. But the practice of mindless eating can ruin your diet. Your best strategy to eat less on Halloween night is to put aside 3 or 4 treats for yourself to enjoy. Pace yourself and eat one treat per hour. You can also choose to hand out smaller candies. Many consumers buy fun-size versions of their favorite candy bars. But many brands make mini-sized treats as well. For example, a fun-size version of a Kit Kat bar is 70 calories. But a Kit Kat mini is just 40 calories. You might be able to satisfy your craving for fewer calories with the smaller version. And there is no rule that you must give out candy. Neighborhood parents—and their children—might appreciate a household that distributes non-candy treats. Stickers, decorative pencils, erasers, glow bracelets or necklaces make fun treats for the kids. Lastly, plan a day of healthy eating to get ready for the night. Prepare a few filling high protein snacks to keep yourself feeling full and satisfied so you don’t raid the candy bowl. If you love the peanuty taste of Reese’s Peanut Butter Cups, try celery stalks with peanut butter, instead. If you love fruity sweet treats like Starburst, freeze fresh berries to munch on throughout the night. And many dieters keep gum handy. The minty taste helps to curb a sweet tooth. But, if you still overindulge, don’t panic. Figure out the exercise cost of your Halloween treats and spend a few extra minutes at the gym in the weeks after the holiday. What Are Some Tips and Ideas for Creating a Healthy Easter Basket? Are You Eating the Right Number of Calories at Breakfast? Is a Calorie Just A Calorie?